It's never too early to start thinking about your next weekend breakfast! * You want to use firm, dry ricotta for this recipe. So unless your ricotta is already dry and compact, place the ricotta in a fine-mesh sieve and set it over a bowl to drain for about 30 minutes to get rid of the excess liquid. Whisk the flour, baking powder, sugar, and salt together in a small bowl. In a larger bowl, mix the ricotta, milk, egg yolks and vanilla together until smooth. Add the dry ingredients and stir until just combined. Whisk the egg whites vigorously with a whisk for about 30 seconds, until the whites are foamy on top (it's fine for it to still be runny underneath). Fold the egg whites into the batter until just incorporated and you have a thick batter. Grease a griddle or nonstick pan over medium heat. Using a 1/3 cup measure, spoon batter onto the griddle and cook on the first side for 1-2 minutes, or until bubbles begin to surface around the edges. Flip and cook the second side until golden. Continue with the remaining batter. 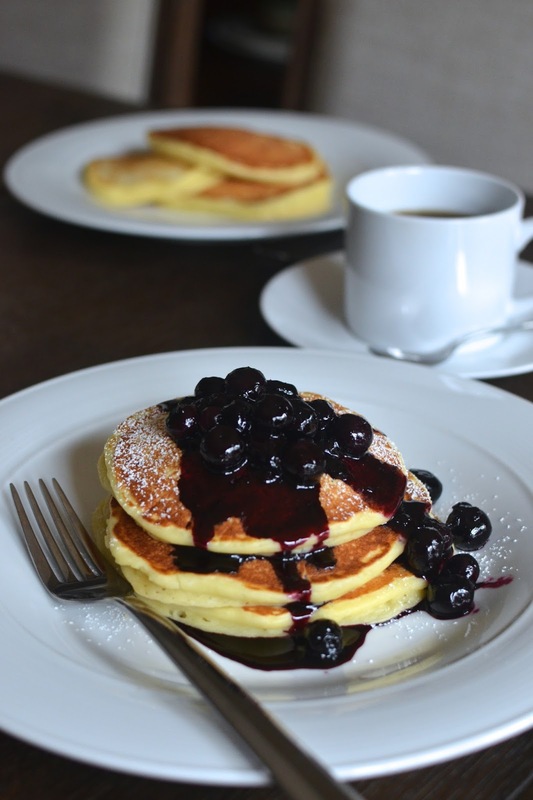 Serve pancakes warm with maple syrup or blueberry compote (recipe below). Place 1 cup of the blueberries, the water, sugar, and lemon juice into a small saucepan over medium heat. Cook for about 10 minutes, stirring or swirling the pan frequently. Add the remaining blueberries and continue to cook for another 8 minutes. Serve warm with pancakes or waffles. haha - yes, thanks for that. They look so tender and fluffy! Save this to try as my husband loves pancakes too. I've had ricotta muffins before but never pancakes! They sound delightful! I love weekend breakfasts too - so nice and slow and not rushed like during the week! I think I had lemon ricotta pancakes at a restaurant once...a little lemon zest is nice, particularly if being paired with blueberry sauce like in this case. I would have done it but my little guy is not that adventurous. Hope you have a great laid-back weekend! I've had something similiar to these before and they were hands down my favorite ever. Breakfast is my favorite meal of the day and I love how you celebrate it. Thanks, Monica! I need to have breakfast...for dessert! Yes, sounds great! These sound so delicate, a perfect breakfast or brunch. Not something I have tried making myself before so I really should! It's similar to sour cream in pancakes or baking. Amazing how a rich ingredients make for fluffy, light results in things like this. Have a nice weekend! These ricotta pancakes look absolutely perfect - so light and fluffy! They were soft and tender, for sure. These pancakes look so good with the compote! I've used cream cheese instead of ricotta before and it's really delicious too! I'm curious about using cream cheese, and imagine it's a similar effect to ricotta or sour cream. Yum. I do love ricotta pancakes.These look fluffy and yummy! I enjoyed trying it. Thanks, Bal! Extra protein is a good thing in the morning. Actually I have some ricotta in the fridge and the family is still sleeping might whip up a batch right now! Wishing you a super weekend! The ricotta blueberry pairing is one of my favourite things to eat. I always order ricotta pancakes if I ever spot them on a menu at a cafe. Your pancakes look so fluffy and soft...like a dream! Glad you like it...thank you, Sonali! I love the idea of putting ricotta in my pancakes! And that blueberry compote? Heaven! Thanks, Ashley. It does feel like a treat with the compote. I've been into making it lately since it's so easy and a nice accompaniment to pancakes.